Sienna Storm is a "unique interactive comic-style videogame" being developed by a new studio headed by veterans of Deus Ex , Neverwinter Nights 2 and the Star Wars Galaxies Trading Card Game. 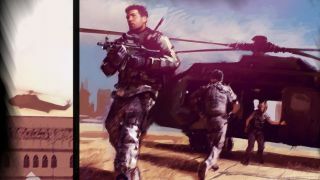 It's a tale about a retired black ops mercenary whose former life leaves him ensnared in a global conspiracy, and while that has an obvious Deus Ex ring to it, the Star Wars Galaxies TCG angle is important too. The game's "challenges"—combat, hacking computers, that sort of thing—will be resolved by way of a "short strategic card game using a customizable deck." And as is the fashion these days, its makers are now seeking support on Kickstarter. It's hard to nail down exactly what Sienna Storm will be like based on the initial Kickstarter pitch , but it's clear that the trading card element will be central to the actual gameplay. "At the start of each card match, you can modify your deck to best suit the situation, even adding in new cards you've earned over the course of the game. This allows you to pick a strategy – trickery, gadgetry, or straight-up violence – that works best for the mission and your personal play style," it explains. "But watch out! The matches are dynamic and based on the story, so you never know what new enemies, old allies, or dramatic plot twists are in the cards to keep you on your toes!" Sienna Storm will offer "an engaging non-linear story set in modern day that has a variety of outcomes based on your decisions and actions." Everything is hand-drawn—the images on Kickstarter are in-game art, not concepts—and it promises a high degree or replayability thanks to branching dialog and choices that "not only have consequences, but also influence your standings with certain characters and involved parties." It's all a bit vague, including the pitch video, which focuses solely on the narrative setup rather than the gameplay; so is the "Risks and challenges" section, which says nothing about the current state of the game or what obstacles it might actually face. The team is seeking $179,000, but it's setting its sights higher right out of the gate: A $260,000 stretch goal will see Deus Ex composer Alex Brandon join the team, while Obsidian's Chris Avellone will come on board as a "creative consultant" at $370,000. The physical rewards offered in the top pledge tier are also dependent upon those stretch goals being hit, the first one for the mouse pad and the second for the coffee mug. The Sienna Storm Kickstarter runs until September 18; the game's estimated delivery date is listed as December 2015.